For an hour or so, you could be forgiven for thinking the naysayers had a point. Temperatures were barely over 30 degrees. An intermittent light snow was falling, and everyone except those competing at that very moment had all their layers of clothing on. What followed from that was perhaps one of the best meets of the season. Very light wind, temperatures pushing 50, and solid marks all around. Those who showed up and stuck around were glad they came. Those who stuck around were treated to Elijah Williams winning the 100 (10.90, just outside of wind legal), the 200 (21.97, wind legal this time), and the 400 (49.80). Teammate Yonas Mogos took over and won the 800 in 1:57.75. TCA's Mason Norman edged Castle View's Edward Rush in the 1600 with a 4:24.00. Tyler Scholl and Grahm Tuohy-Gaydos went even closer at the finish of the 3200 before the weather broke to glorious sun. 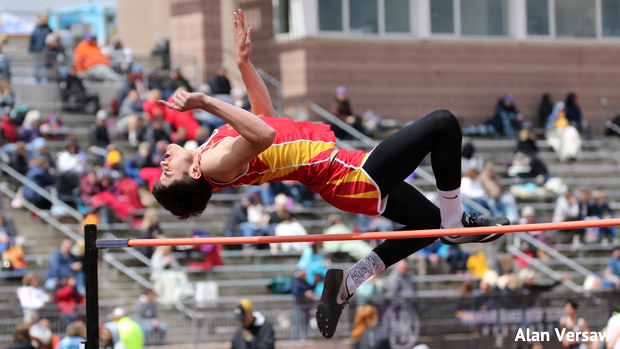 Hector Ortega brought a win inside the hosting district with a 6-4 clearance in the high jump. Teammate Sterling Adams brought three more with wins in the 110 hurdles, long jump, and triple jump. Silver Creek's Hunter Potrykus captured the pole vault at 13-0. 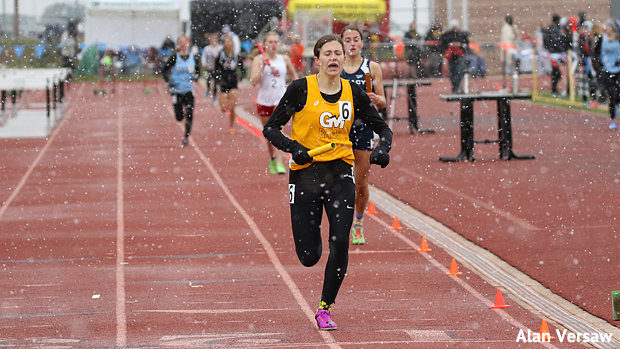 On the girls side, Kasey Klocek had her way with the 400 and 800 fields in the sun. That was after she anchored a winning 4x800 in the snow. Ralston Valley's Elizabeth Schweiker kept the Jeffco theme going with a runaway win in the 1600. Before Jeffco distance got untracked, however, Katie Flaherty dominated the 3200 with a wire-to-wire conquest. D'Evelyn's Esther Diza-Mbelolo figured to win the hurdle titles, but Mullen's Kilah Freelon got in the way of the sweep with a 45.42 in the 100 hurdles. Freelon, by the way, is a freshman, so we might want to get accustomed to hearing more of that name. Freelon also won the triple jump at 35-6.5. Another freshman, Loveland's Kajsa Borrman, brooked no rivals in the discus. She threw 145-6 to state her case. And, after her case was stated, there were no other cases hear. Borrman won by over 25 feet. Greeley West's Lauren Whyrick won the shot put at a very nice 39-3, solidifying the case that the girls throwing circles were at least one of the places to be on Saturday. Team titles went to The Classical Academy in the girls and Ralston Valley in the boys. Don't get too excited about team titles yet, however, as there is still much to be determined about the team outcomes of this season. And so this year's Mountain Range Mustang Invitational goes into the books as one of the best meets thus far of a season pock-marked with postponements and cancellations. Sometimes you have to be patient, but the sun eventually shines on the wide oval at 128th and I-25.